The Muskogee Phoenix ran excerpts from a larger article from the Associated Press that was an all-out Democratic Party hit piece masquerading as journalism in today's newspaper. The occasion, and the familiar target? A "fact-check" on 'Going Rogue', the soon-to-be-released book by former Alaska Governor and 2008 Republican Vice-Presidential candidate Sarah Palin. The Phoenix never posts AP newswire stories (also known as 'opinion') on their website, so here it is, with notes from Yours Truly whenever I couldn't hold it in anymore. Again, this is an excerpt from an even larger article by Calvin Woodward of the AP. Sarah Palin's new book reprises familiar claims from the 2008 presidential campaign that haven't become any truer over time. Ignoring substantial parts of her record if not the facts, she depicts herself as a frugal traveler on the taxpayer's dime, a reformer without ties to powerful interests and a politician roguishly indifferent to high ambition. Palin goes adrift, at times, on more contemporary issues, too. She criticizes President Barack Obama for pushing through a bailout package that actually was achieved by his Republican predecessor George W. Bush — a package she seemed to support at the time. PALIN: Says she made frugality a point when traveling on state business as Alaska governor, asking "only" for reasonably priced rooms and not "often" going for the "high-end, robe-and-slippers" hotels. THE FACTS: Although travel records indicate she usually opted for less-pricey hotels while governor, Palin and daughter Bristol stayed five days and four nights at the $707.29-per-night Essex House luxury hotel. PALIN: Boasts that she ran her campaign for governor on small donations, mostly from first-time givers, and turned back large checks from big donors if her campaign perceived a conflict of interest. THE FACTS: Of the roughly $1.3 million she raised for her primary and general election campaigns for governor, more than half came from people and political action committees giving at least $500, according to an AP analysis of her campaign finance reports. The maximum that individual donors could give was $1,000; $2,000 for a PAC. Of the rest, about $76,000 came from Republican Party committees. PALIN: Rails against taxpayer-financed bailouts, which she attributes to Obama. She recounts telling daughter Bristol that to succeed in business, "you'll have to be brave enough to fail." THE FACTS: Palin is blurring the lines between Obama's stimulus plan — a $787 billion package of tax cuts, state aid, social programs and government contracts — and the federal bailout that Republican presidential candidate John McCain voted for and President George W. Bush signed. 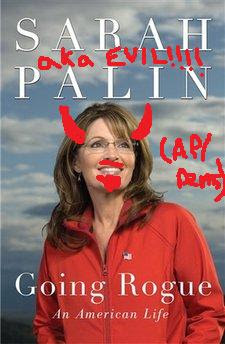 Palin's views on bailouts appeared to evolve as McCain's vice presidential running mate. In September 2008, she said "taxpayers cannot be looked to as the bailout, as the solution, to the problems on Wall Street." A week later, she said "ultimately what the bailout does is help those who are concerned about the health care reform that is needed to help shore up our economy." During the vice presidential debate in October, Palin praised McCain for being "instrumental in bringing folks together" to pass the $700 billion bailout. After that, she said "it is a time of crisis and government did have to step in." PALIN: Says Ronald Reagan faced an even worse recession than the one that appears to be ending now, and "showed us how to get out of one. If you want real job growth, cut capital gains taxes and slay the death tax once and for all." Economists overwhelmingly say the current recession is far worse. The recession Reagan faced lasted for 16 months; this one is in its 23rd month. The "article" gets even worse, but the Phoenix remarkably did not include it in the newspaper. This piece of Democratic propaganda is passed off as journalism these days? I've come to expect extreme left-wing bias from the media, but this really surpassed my expectations. Since when did the AP do book review hit-pieces on conservative leaders?